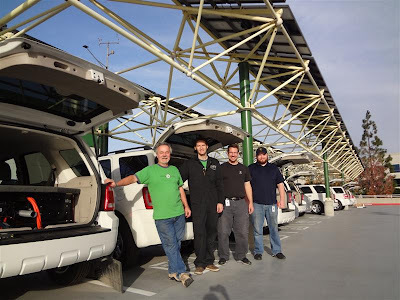 Green Gears, ECOtality, and the Department of Energy collaborated on a vehicle project with South Coast Air Quality Management District (SCAQMD) . 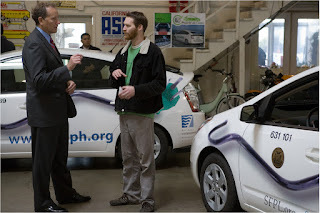 The project consists of 21 Ford Escape hybrid vehicles owned by SCAQMD converted to Plug-in Hybrid drive by Quantum. 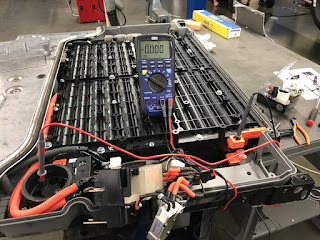 ECOtality and Green Gears collaborated on the installation of cellular data loggers to record vehicle fuel economy through funding from the Advanced Vehicle Testing Activity contract from the Department of Energy. The vehicles will be operated in the LA area by SCAQMD. A solar parking area provides energy to the vehicles that get exceptional fuel mileage by combining battery power and gasoline power. The cellular data loggers will record fuel consumption as well as electric energy consumption from the solar array to give an accurate picture of how a larger fleet of similar vehicles could affect air quality in the LA area.